Back in the day, playing games would often refer to board games in general. However, with the modern-day technology, a lot of people have been missing out on the concept. Well, with Alexa, you will finally be able to experience board games with a cool spin to them. Sensible Object has debuted its new game, When in Rome, which is a family board game that pits two teams against each other in a race to travel the world. The game basically consists of a board and a few colored pieces with Alexa taking in the charge. You start the game by enabling the When in Rome skill, then you start the game. Alexa then prompts you with questions as you tool around the board. The rules of the game are quite simple, with Alexa guiding you through everything. The game describes how to set up the board and gets you started, then you just trigger it with your voice as you play. Teams move from city to city — as long as there’s a connecting flight, denoted by dashed lines on the board — answering multiple-choice questions from locals. There are both three-point easy questions and five-point difficult questions from categories such as arts and culture, sports and games, myths and legends, and food and drink. If you answer correctly, you get the points and the local becomes your friend. You can then use the city as a sort of connecting flight in subsequent turns, and the local will refuse to let the other team answer a question for points. 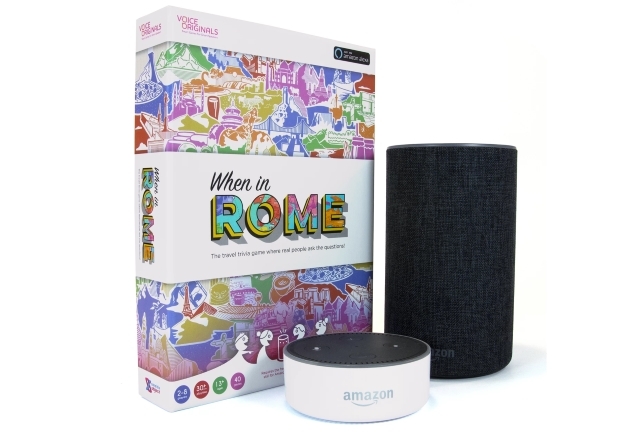 When in Rome is undoubtedly an interesting title, one that manages to bridge the gaps between virtual and real-world gaming. What’s more is that you may just learn some fun facts on your next trip, provided the trip is to one of the 20 cities on the board.